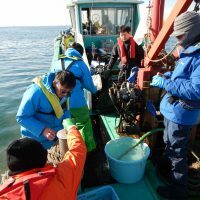 The project team for creation of habitat under the Public-Private Cooperation Forum for Tokyo Bay Restoration performed a field survey on spawning ground for marbled flounder collaborating with Chiba Prefectural Fishery Research Center in off-Akanehama of Tokyo Bay on December 25, 2018. The project team proposed a project for creation of spawning ground of marbled flounder and this survey is based on this project. Copyright © Estuarine and Coastal Environment Laboratory (Jun SASAKI Laboratory), the University of Tokyo All Rights Reserved.